Toma, D.M. ; Del Rio, J.; O'Reilly, T.C. ; Manuel, A.
Nowadays, the studies of episodic processes in the ocean is manly done through the innovative facilities called ocean observatories which provide unprecedented amounts of power and two-way bandwidth to access and control sensor networks in the oceans. The most capable ocean observatories are designed around a submarine fiber optic/power cable connecting one or more seafloor science nodes to the terrestrial power grid and communications backhaul. In a network consisting of tens, hundreds or thousands of marine sensors, manual configuration and integration becomes very challenging. Methods are required which support this task to minimize the administration efforts. This paper addresses this issue and presents an approach for the automatic discovery of marine sensors in ocean observatories. 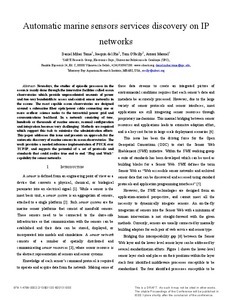 The work provides a needed reference implementation of PUCK over TCP/IP, and suggests the potential of a set of protocols and standards that could realize true end to end “Plug and Work” capability for sensor networks. Nowadays, the studies of episodic processes in the ocean is manly done through the innovative facilities called ocean observatories which provide unprecedented amounts of power and two-way bandwidth to access and control sensor networks in the oceans. The most capable ocean observatories are designed around a submarine fiber optic/power cable connecting one or more seafloor science nodes to the terrestrial power grid and communications backhaul. In a network consisting of tens, hundreds or thousands of marine sensors, manual configuration and integration becomes very challenging. Methods are required which support this task to minimize the administration efforts. This paper addresses this issue and presents an approach for the automatic discovery of marine sensors in ocean observatories. The work provides a needed reference implementation of PUCK over TCP/IP, and suggests the potential of a set of protocols and standards that could realize true end to end “Plug and Work” capability for sensor networks. Toma, D.M. [et al.]. Automatic marine sensors services discovery on IP networks. A: OCEANS MTS/IEEE. "Proceedings OCEANS'13 MTS/IEEE Bergen - The Northern dimension and Challenges". Bergen: 2013.